As part of our Families’ Focus Week, our Director of Strategy Paul Buddery paints a powerful picture of why our volunteer support is needed now more than ever. The phrase isn’t used as much as it once was, and the person who coined it has had a rough few years, but ‘It Takes a Village’ still packs a proverbial punch. 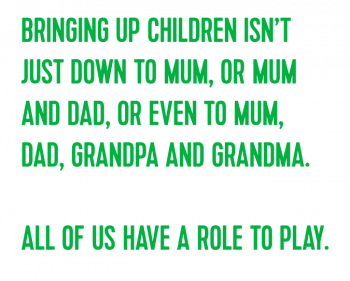 It’s a simple proposition: bringing up children isn’t just down to Mum, or Mum and Dad, or even to Mum, Dad, Grandpa and Grandma. All of us have a role to play. All of us are the ‘Village’ recognised by Hillary Clinton. A good village that supports families is one in which people look out for and help each other in innumerable ways: people are positive role models, considerate neighbours and generous friends; informally, they look out for each other’s children and share some of the parenting load. It’s a picture of family and community life that seems attractive and rings true. But is this picture of village life a bit too cosy? What if families are really coming unstuck, putting children’s safety and well being at risk? One of the hard lessons of recent years has been that, as a village – as a society – we have missed or turned a blind eye to children at risk and families in trouble. We have been a complacent village. But, slowly, we are trying to put this right. One consequence has been a massive increase in pressure on our child protection systems. The number of children subject to child protection inquiries increased by over 150% in the last decade (from 2006/7 to 2016/17). While it’s right that the state should take ultimate responsibility for children’s rights, can the state also engage more creatively with citizens to secure those rights? Are volunteers part of an effective and sustainable response to the issue of families in trouble and children at risk? At Volunteering Matters we think that the answer is yes, that some of the models and mechanisms for this are already working and need to be scaled up, and that many more preventative, volunteer designed and delivered programmes should be encouraged. 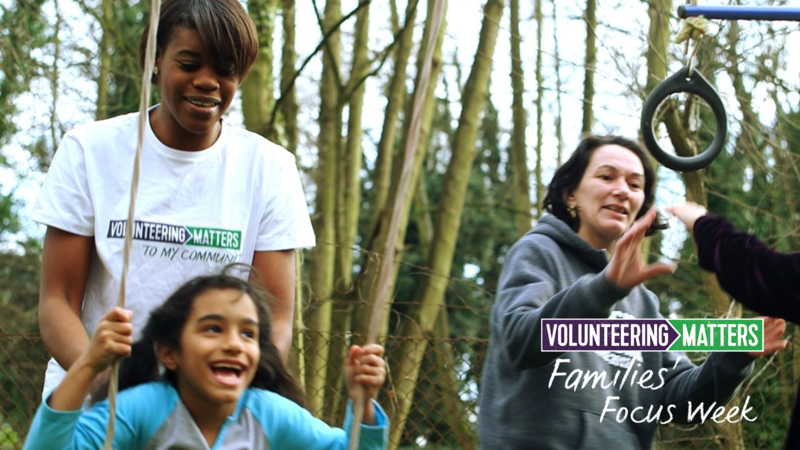 Our Volunteers Supporting Families projects have been working for years to deliver support to families where children have been identified as being at risk or in need of support. They help families, not by replacing social workers or other professionals, but by making different conversations possible. They’re practical examples of what it means to be a village in this day and age. Well-trained volunteers offer advice and encouragement to parents in ways that professionals simply can’t. They do it not by bringing authority, but by offering a more equitable relationship. They bring their freely given time, and a life experience that is often closer to that of the parent or carer than that of the professionals they’ve been involved with. For example, one of our families had been referred because of concerns about the mother’s use of physical punishment. The mother felt that she was being penalised for normal, responsible parenting. Because her volunteer was from the same cultural background, it was possible to have a positive conversation about doing things differently – one which respected the strengths she brought to her parenting, while unequivocally ensuring the physical protection of her children. In effect, the mother felt supported to change by her community, rather than pushed to comply by social services. It’s a model of change that works, and works cost-effectively. 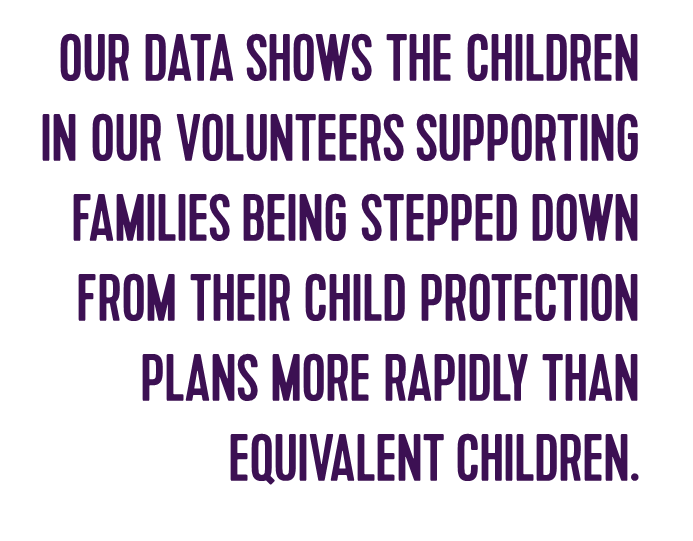 Our data shows the children in our Volunteers Supporting Families being stepped down from their child protection plans more rapidly than equivalent children. Nationally, around 21 per cent of children cease to be of concern after six months; in Volunteers Supporting Families supported families 46 per cent cease to be of concern. An independent evaluation found that for every £1 spent on the projects, there was a return of £2.23 in the form of adverse outcomes avoided. Even in hard times for local government funding – perhaps especially during hard times for local government funding – the case for ambitious family support, shaped and delivered by volunteers needs to be made. In the longer term, it will only be through active and responsible communities that we will be able to secure safer outcomes for all of our children.